Among the fifteen participants of this year’s HM we had some very experienced leaders and also the youngest HM participant ever. All of them though directly involved in youth ministry, which proved to be special as their responses and questions were not general but specific to their situation. Another special treat of this conference is the fact that nearly all of the participants came with a plan for HM multiplication that makes sense. They were not pushed to, but they all wanted. I have a strong hope that they will as their plans were specific and very realistic. Among the participants there was also a national youth ministry leader of the largest evangelical denomination and as he was leaving he said “I want to be History Makers” – meaning he wants to use it in his ministry! This was our 10th History Makers conference… and also the smallest one! Though disappointed at first with low participation, we were very happy with the week at the end of it. The atmosphere on the conference was better than any time before, people were very engaged and open to talk and discuss and it seems the sessions went deeper in their hearts than usual. And we are very hopeful for a lasting impact as we experimented with different ways of group reflection to help them remember and take more of our sessions. We also put a stronger emphasis on finding a mentor to go further in their faith and visions. The outcome is that all of the participants have a plan for how to find a mentor or set things up with the ones they already have, to which we provided them with a detailed “manual” on how to approach them. And in two weeks we will contact them and check how they proceeded! There were 30 people at the conference including all of the speakers (21 participants) and it was one of the best conferences we have had so far. The atmosphere was great since the very first day... (and) one group took the courage to present their vision in front of the church the next day after returning home and the response was very encouraging – people want to join in and fast for the vision. ​Other people from one specific denomination are [planning on] using HM as a denominational educational program… Really great week. "I decided to give one area of my life over to God, which I had always wanted to rule myself… I don’t want to anymore :-)"
"He (God) showed me that I was not broken for lost people and that I didn’t really care for them. So I prayed for some time and one night God gave me real desire for human hearts and to be used"
One of our longest running History Makers teams held their annual HM Journey at the beginning of September at the beautiful KAM centre in Malenovice. Another year and another great week of equipping for the urgent task in hand. Please take a moment to pray for the deepening of the HM ministry in the Czech Republic. "HM is a great impulse for me to change the old things and apply the new things in my life, and thus better fulfill God’s plan for my life." [History Makers enabled me to] "renew my passion for God and do something for Him in reality"
"He helped me to realize where I currently stand and to get new energy, new passion for ministry, for new things and not to be afraid to step into ministry in faith. And most importantly take steps of faith." "It gave me a new passion for ministry and a desire to give myself to God, so that he could work in me and accomplish his work through me." HM Czech Republic met in the beautiful surroundings of Malenovice, east of Ostrava. Our longest running annual HM is bearing fruit in a country where (like much of Europe) the evangelical church is tiny. God is strong and it was encouraging to hear how God is moving through different churches and ministries, as well as HM alumni. Tom is now our HM Champion and testifies to the transformative difference HM has made in his life. 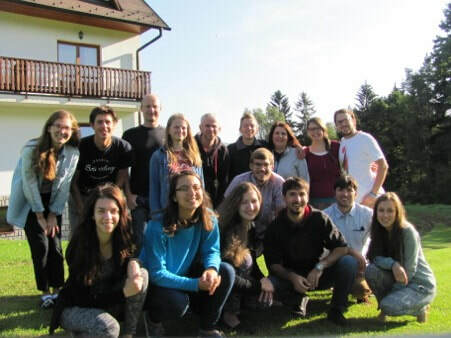 He now leads the training department at a key ministry called Josiah Venture in Czech Republic and is therefore impacting many young leaders across the nation. Another young man, Martin, who went through HM as a young Christian, has been discipled by Tom and has been multiplying HM in youth groups. He is now recognised as a key youth leader nationally in his denomination. He too testifies that HM has played, and is playing, an important part in his leadership experience. "He assured me of his mission for me and showed me how to start fulfilling it… Honestly I’m very excited. I even have to say – and I am saying this gladly – that this was the most beneficial conference I have ever been to." I was a Jesus’ follower for less than six months when I attended History Makers (HM) in the Czech Republic. Although it is not usual, I was so blessed to have people around me who believed in me and invited me to History Makers even when I was a baby in God’s Kingdom. Not being from a Christian family, at the time I was confused about what from my old life I should give away and what I can keep and use for the glory of God. I had been engaged in leadership since I was 16 (youth clubs, school projects, girl-scouts…) and I really liked it and people around me told me I am good at it. But I didn’t know that it is a gift from God and that God might want me to use it within His church. I thought that I should attend church for years to be able to be a leader of something. At the same time I had a few non-christian friends who became deeply interested in Christianity. I came to HM with the idea “I want to do something for them”. HM helped me to see that behind this idea is a great vision. Not only my vision but vision which God gave me and which He desires to see becoming true. The vision was that my friends give their lives to Jesus. Day by day at HM I learned that by working on God’s field I don’t have to learn everything from beginning but I can let God use my experience from other contexts for His purpose. And this experience were richly increased as HM’s leaders build in our minds the whole concept of vision and how we can work on it step by step to make it real under God’s leadership. The greatest thing on it was that it wasn’t disconnected from our whole life. I have attended some non-Christian leadership courses and at none of them was discussed how being a leader impacts my personal and family life. However, HM showed me that I can’t be a good leader without having good relationship with Jesus and my family and all my neighbours and friends and helped me to see how I can work on these relationships too. When I came back from HM, me and two of my friends from our church started to organize a small group for our non-Christian friends. None of us did something like that before. However, we trusted God that He will use our effort. And thanks to HM I had some idea about which steps are useful to take. More importantly, thanks to HM I was also able to see all the little things we did in the big context of God’s vision and it helped me to fully rely on God and to stay faithful and patient in the work. We started with this small group in October. We had five regular participants. In December one of these participants fully gave himself over to God. In June he was baptized. Another participant believed in God before he was attending our small group but it took him some time to really submit all areas of His life to God. In June he was baptized, too. In July one girl from our group dedicated her life to Christ. And another participant from what we can see is on his way to give his life to Jesus. We know that these miracles happened only thanks to the work of the Holy Spirit. And we are grateful that God used us to create through us a place where He can have opened our friends’ hearts. And I am sure that God let the seeds He sew into me at History Makers to become beautiful flowers which I could give to our participants through everything we did at our meetings. Now I am studying at a university in the US for a year and after a month here God put onto my heart that there are many people who were brought up in a Christian family but they don’t have real relationship with Jesus. What can I do for them? Encouraged by HM and by doing our small group I started to think about creating such a group for these students here. A friend of mine became interested in that too. Right now we have clarified our vision and we are working on building a team of people who will share this vision. I really mean it when I say I can’t imagine doing this without attending History Makers.